U.S. 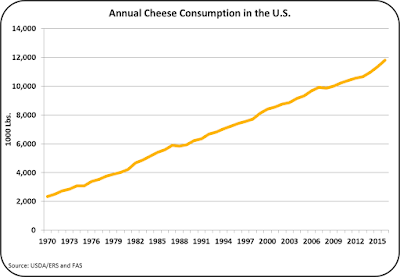 Dairy Consumption is Rapidly Changing. Producers and Processors Need to be Preparing. 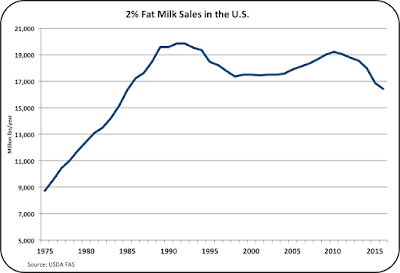 U.S. sales and consumption of Dairy products is changing at a brisk pace. 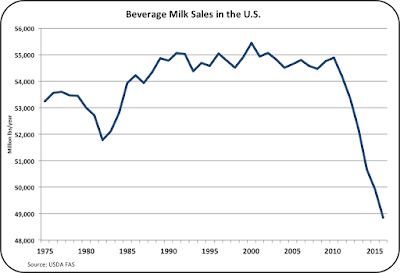 Sales of beverage (drinking) milk are declining rapidly. Fat free milk sales have declined 40% in just five years. 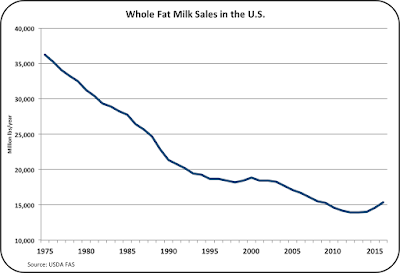 Reduced fat (1% and 2% fat) milk sales have also declined during this period. After a ten-year period of growth, yogurt sales have plateaued. What's increasing? 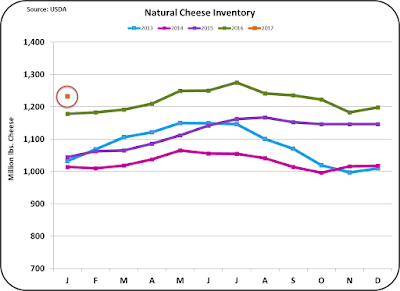 Cheese sales continue their growth and butter sales are showing an uptick. 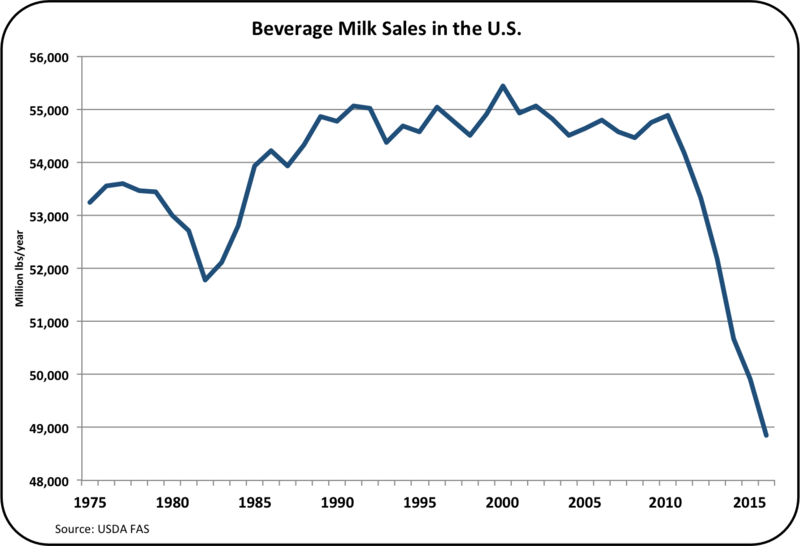 The decline in beverage milk sales is dramatic, dropping 10 percent in just the last five years. The often-quoted reason is that there are so many new drink products that beverage milk is losing shelf and mind space in the drinks category. 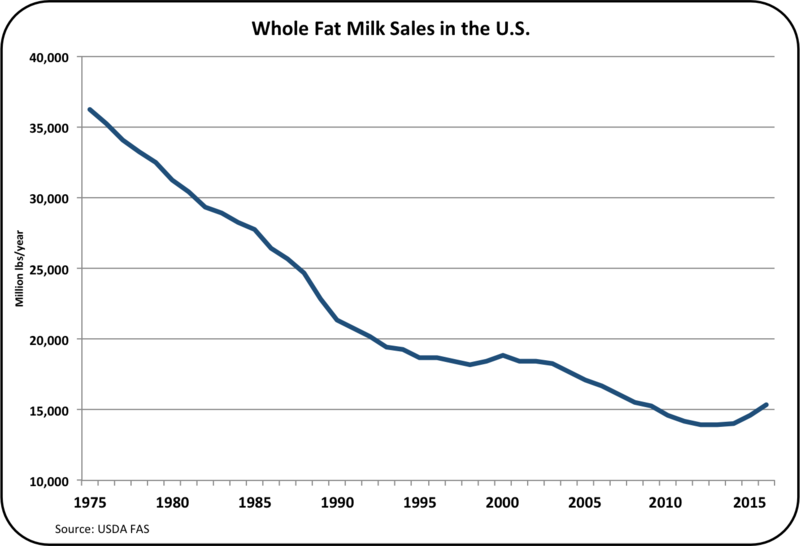 Sales of reduced fat and nonfat milk have all fallen in the last five years. 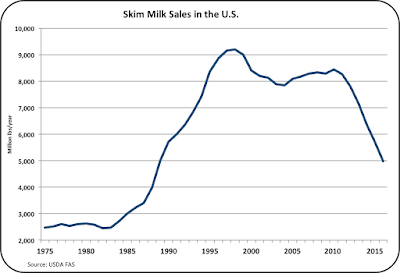 The drop in skim (fat free) milk, if continued, would nearly eliminate this product over the next decade. As sales decline, retailers carry less and display less shelf space, which accelerates the decline. 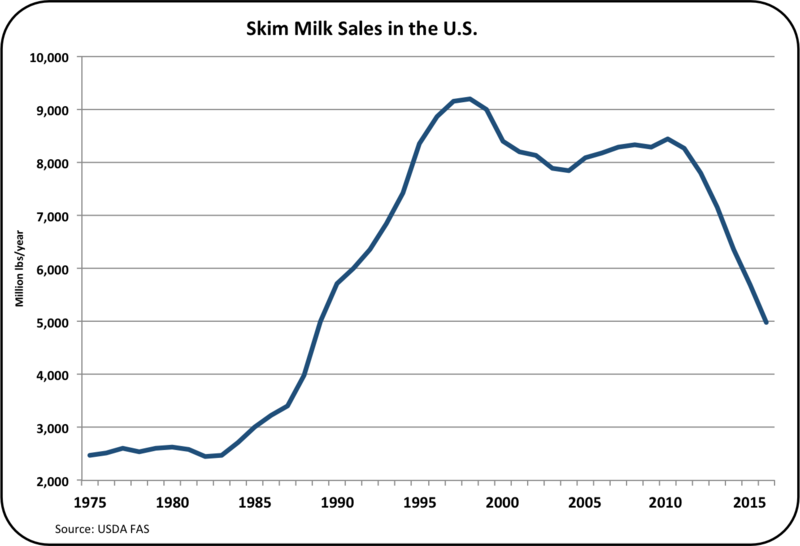 When reduced sales reach the tipping point, skim milk could become a niche product, not available in all stores. 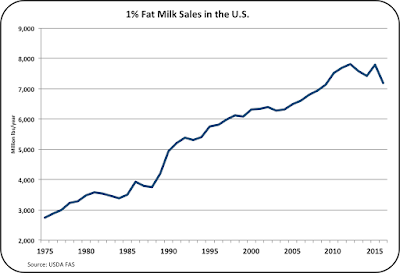 From 1995 to 2005, one percent fat milk was a growing category while two percent fat milk was declining. 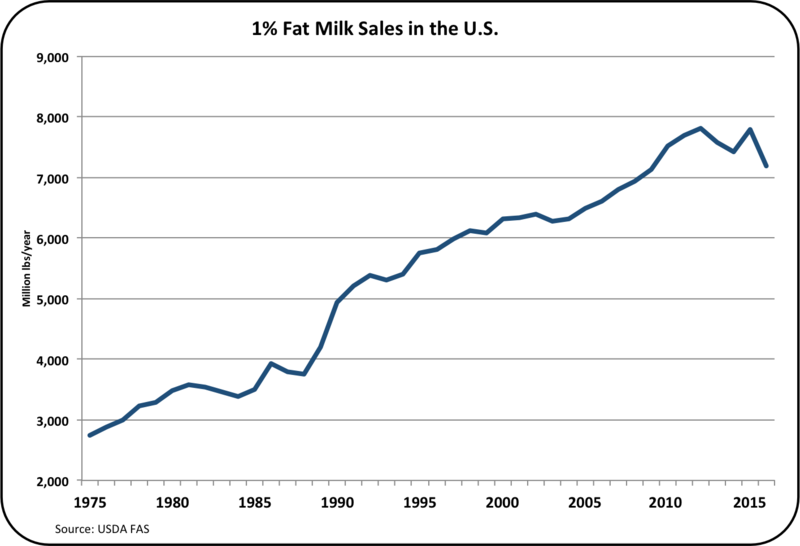 It was possible that one percent fat would surpass the category leader, two percent fat milk. Now, the comparison is between which will decline faster. 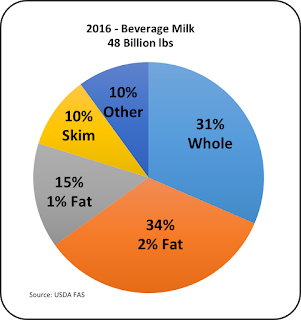 Two percent fat milk is still the category leader, but just by a hair, as sales of whole milk have increased slightly. There was just a 7% difference in sales volume in 2016. 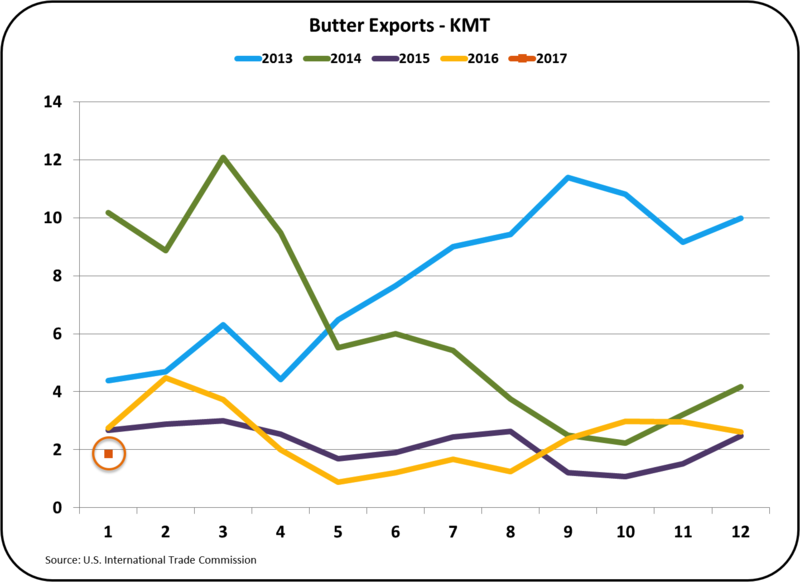 Obviously, the decline in overall beverage milk with significant declines in skimmed and reduced fat milk have significantly reduced the availability of butterfat for churning. From a longer-range point of view, the two charts below compare the makeup of milk sales in 1975 and 2016. 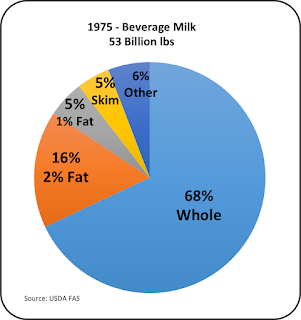 While the population growth has risen by 50% during this time, total sales of beverage milk have declined by 8%. That would indicate a 40% drop in per capita sales and consumption. 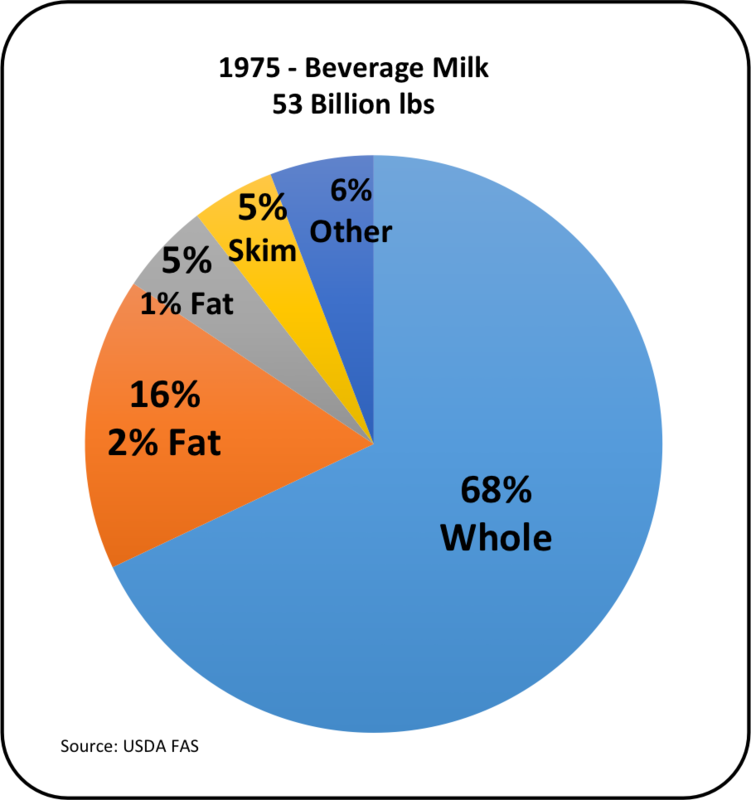 Whole milk is less than half of what it was in 1975. With the continuing reduction in sales of beverage milk, there will be a an equal drop in Class I milk. How this change impacts producer prices will be covered later in the post. 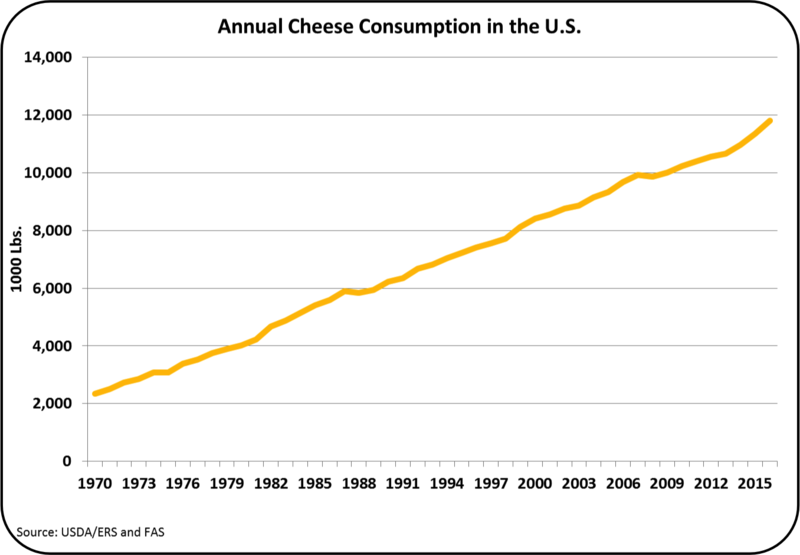 Cheese sales continue their growth curve. Some developed European countries consume even greater per capita amounts of cheese, so it is very possible that this growth will continue. 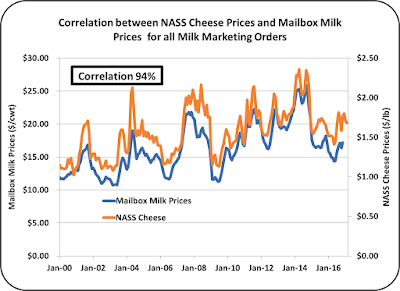 While there is some price elasticity of demand in cheese sales (higher prices mean slowing sales), current cheese pricing is not at a level that would adversely impact sales. 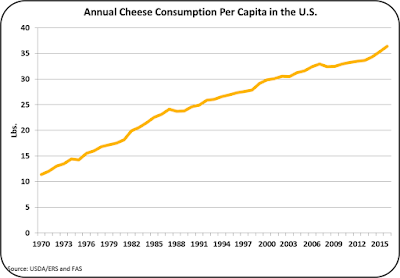 Considering these factors, continued per capita growth of cheese consumption can be expected. Therefore, more Class III milk with good characteristics for cheese production will be needed. Typically, higher milk protein levels and a low somatic cell count are key characteristics of good quality Class III milk. 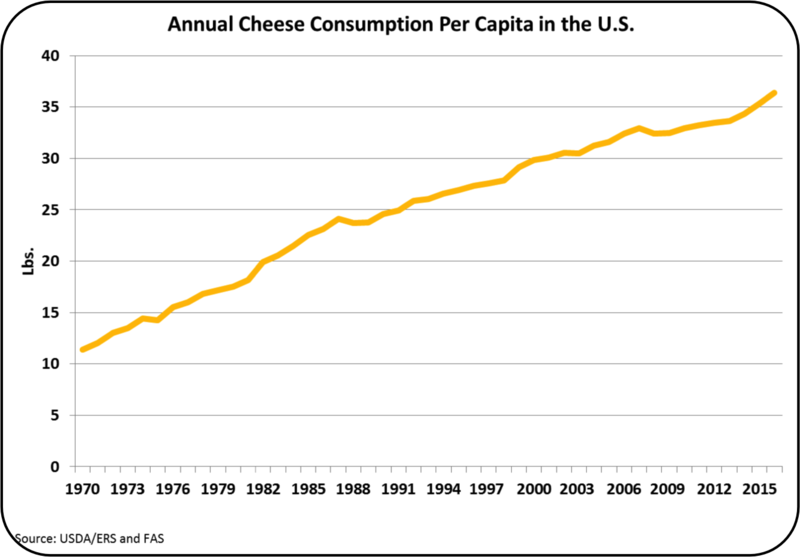 Over the last 46 years, with the increase in per capita consumption and population increases, the total volume of cheese sold domestically has increased by an average of nearly 4% per year! Class III milk is already the largest of the four milk classes. Class I represents the second largest milk class, and as it declines and Class III grows, it is possible that Class III may soon represent the majority milk production. 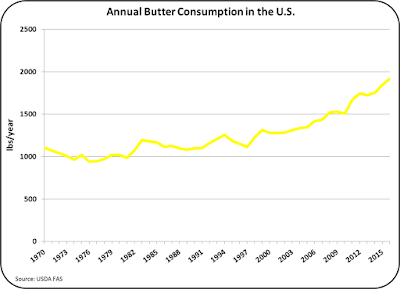 Butter consumption is an amazing story. 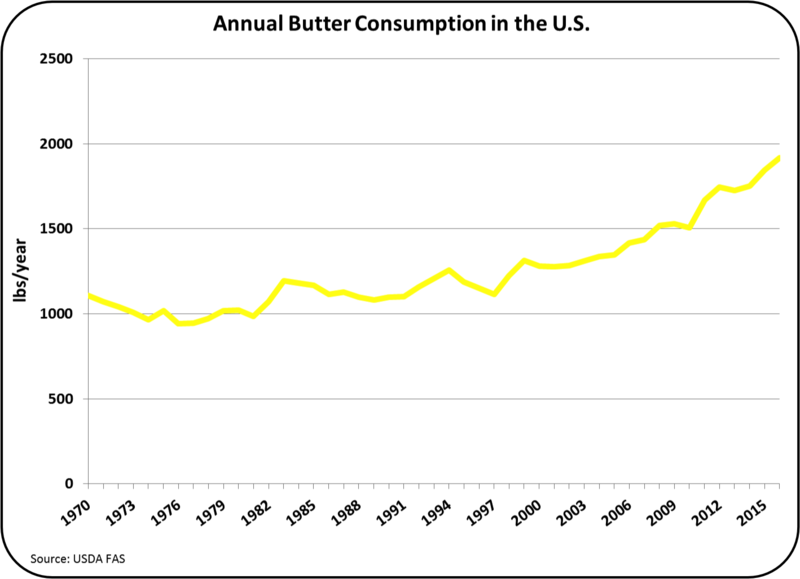 During World War II, butter consumption dropped by nearly 75% as lower priced and readily available vegetable based spreads emulating butter took the market. 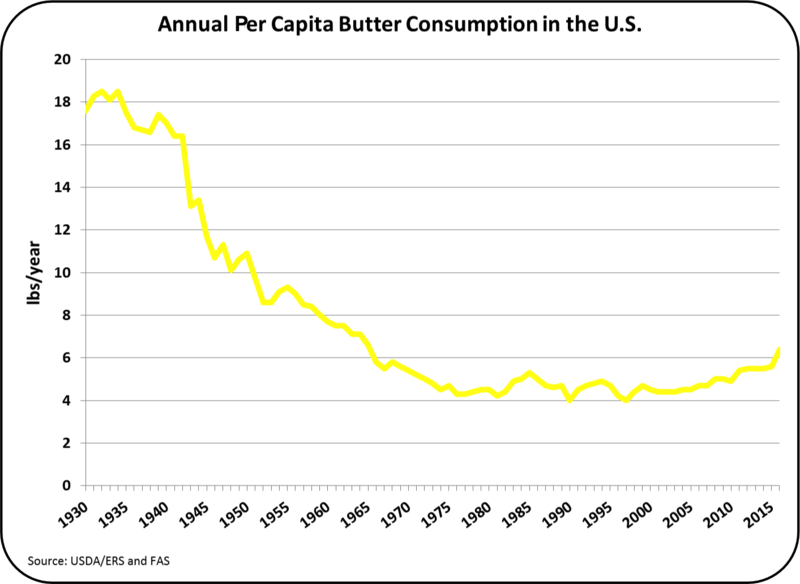 The lower per capita consumption of butter continued for roughly 40 years. However, in the last five years there has been some growth. 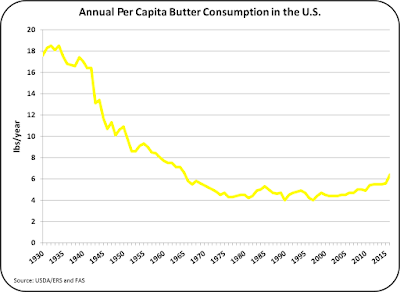 As a result, due to both population growth and increased per capita consumption, butter demand has increased nicely. 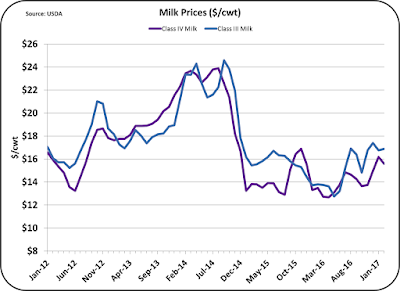 How will the sales and consumption changes impact producer milk prices? And how will these changes impact the desired components in milk? Less Class I milk will be needed. Class III milk for cheese, which is currently the largest Class of milk. The Class III category will continue to increase and dominate the demand for milk. For those paid on the component system, this will reduce the Producer Price Differential. Lower amounts of the high priced Class I milk will reduce the blended Uniform price, and thereby reduce the difference between the Uniform price and the Class III price, which will result in a lower Producer Price Differential. Those Federal Orders paid on the advanced system are primarily Class I producers. The changes in consumption will impact these Orders with reduced demand. The Florida order will see the greatest impact. The Upper Midwest Order is well positioned to grow. Currently, over 80% of the Upper Midwest Order milk is Class III. 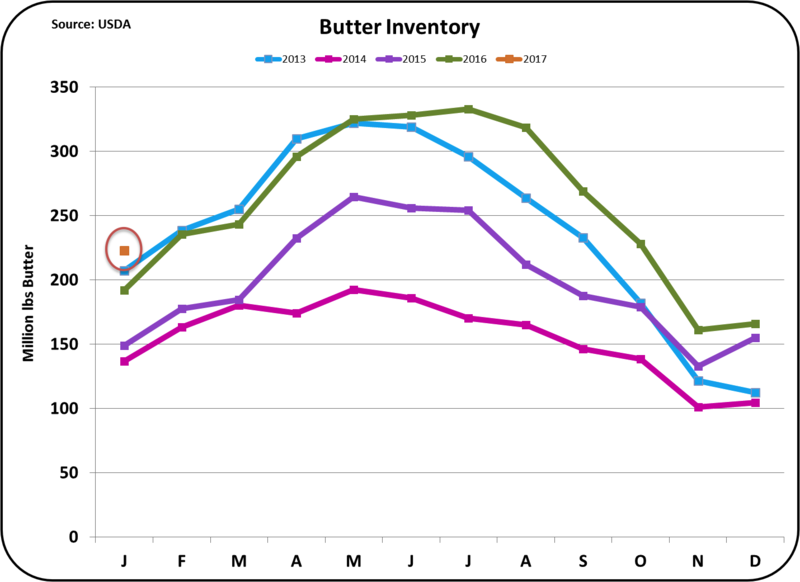 With less butterfat available from beverage milk, pressure on butter availability will remain high keeping the butter price high. Unfortunately, this has little impact on the Class III price. 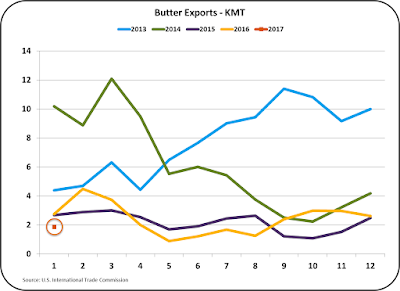 With higher priced U.S. butter, exports will remain low and imports will increase. It's doubtful that the increased demand for cheese can offset the reduction in demand for beverage milk. Also, with a strong USD, exports will remain an uphill battle and imports will look increasingly attractive. Therefore, with stagnant domestic demand and pressure on exports, it will be difficult to support continued growth in cow numbers. In fact, with higher producing cows, fewer cows may be needed to met demand. With less dependence on beverage milk and stronger demand for cheese and butter, milk protein and butterfat will be a priority for producers and a necessity for financial returns. 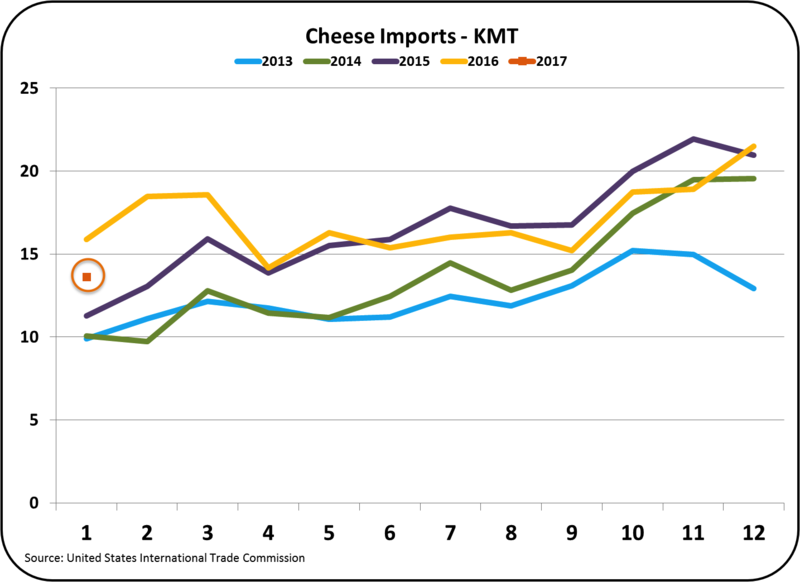 Dairy export and import data for January 2017 is now available. In total, the data is difficult to judge. 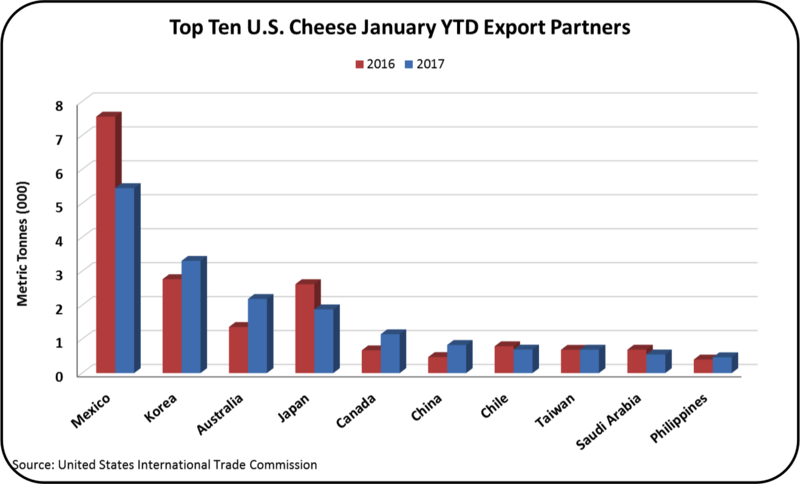 Cheese exports were at prior year levels and butter exports were beneath prior year levels. 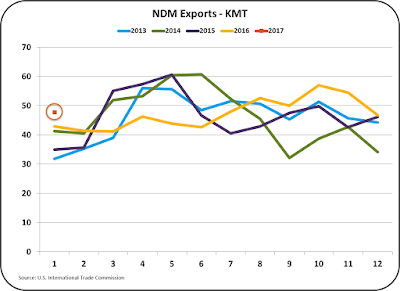 Nonfat dry milk exports were above the prior year, but so were imports, leaving net nonfat dry milk exports unchanged from the prior year. 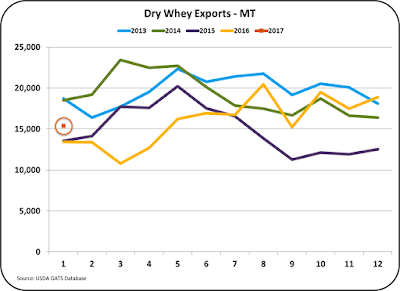 Dry whey exports were slightly above the prior year. Why are exports and imports important? 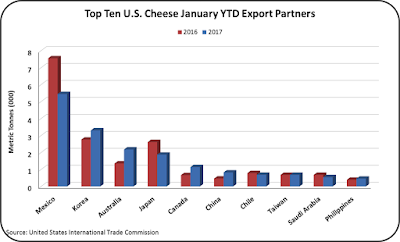 They represent a large part of the demand for U.S. dairy products and they are the most volatile part of total demand. Changes in demand directly influence inventory levels which in turn influence producer prices. 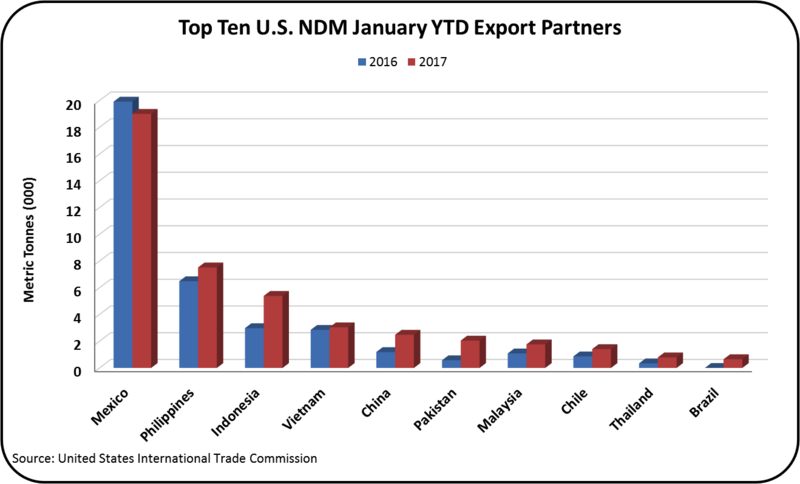 The USDEC provides timely updates on exports. However, there seems to be a lag in data posted in their new blog. As an example, although the current USDEC post carries the date of March 15, 2017, much of the data is updated only through November 2016. A better view of the current data provided and discussed by the USDEC can be found in their long-term format. That data is available at this link. Unfortunately, the updated data in the long-term format carries almost no information on imports. As covered in two prior posts to this blog (Part One and Part Two), imports are currently more of an issue than exports. 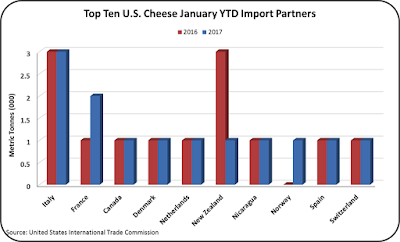 Cheese exports and imports will be discussed first, as they influence cheese prices and cheese prices have the most influence on U.S. producer milk prices (see prior post). 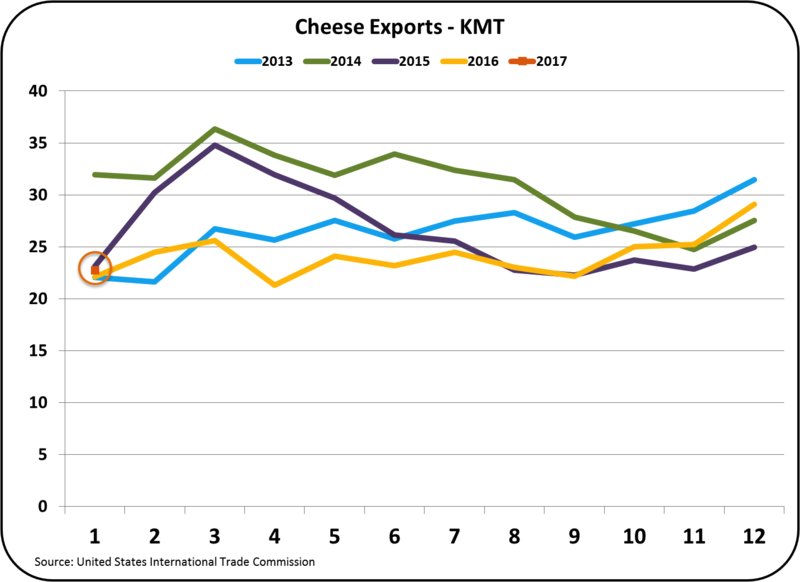 Cheese exports for 2017 have started at the same level of the two prior years showing no improvement or decline. The exports when reviewed by the receiving countries, showed significant changes. Exports to Mexico were way down. However, the losses in Mexican purchases were made up by increased exports to South Korea, Australia, Canada, and China. There is some uncertainty in exports to Mexico with the chance that NAFTA will be revised. This could be influencing the volume of exports to Mexico. In a business sense, if the loss in exports to Mexico can be made up through exports to other countries, that would certainly help diversify the customer base and reduce dependence on exports to Mexico. 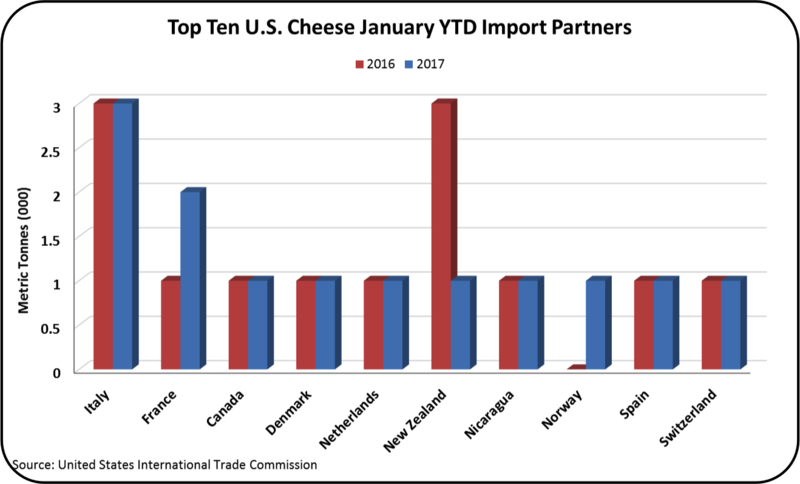 The good news for January is that cheese imports were lower than the prior year (see chart below). 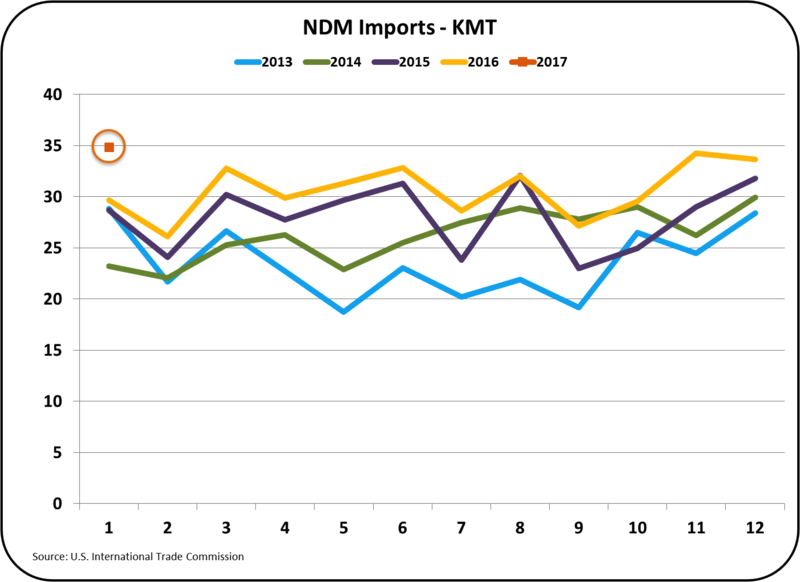 The volume of imports was midway between 2015 and 2016 levels. Its to early to say that this is the beginning of a trend, but it will be followed closely in future posts to this blog. There were significant changes in the sourcing of imports. 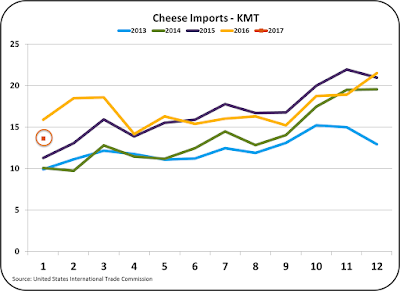 Cheese imports from New Zealand dropped by two-thirds and were unilaterally responsible for the decrease in imports from the prior year. 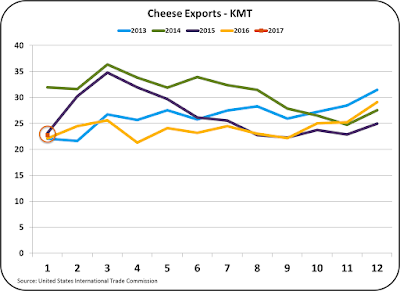 However, a near doubling of imported cheese from France offset some of the New Zealand reduction. 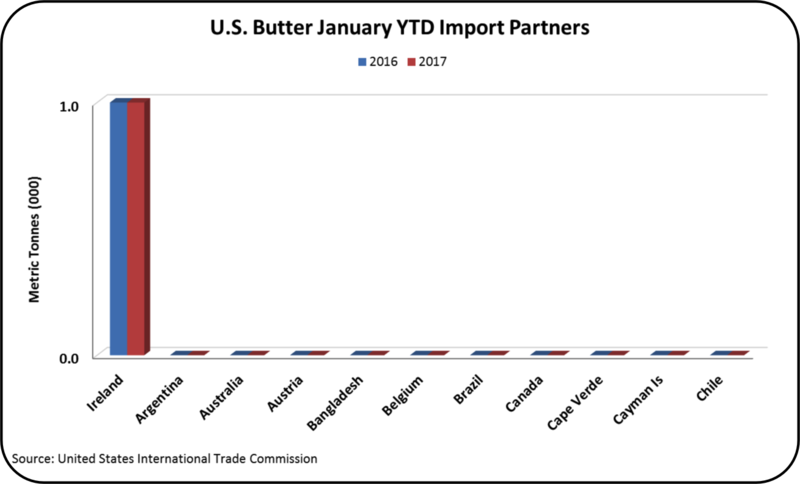 Exports of butter in January 2017 were at a five year low. 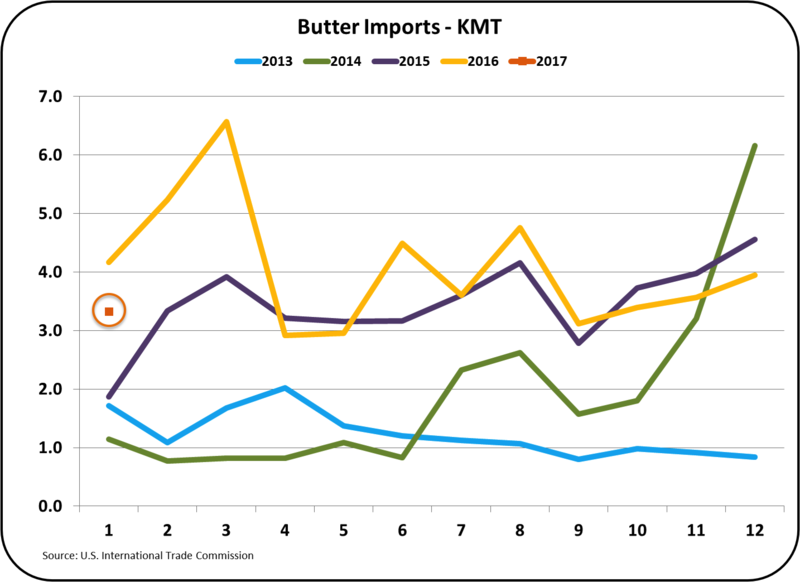 The price of U.S. butter remains too high to compete in the international markets with other exporting countries. The butter exports were primarily to Canada and Mexico. Some or the reasons for the significant changes in Canadian purchases were covered in the February 26, 2017 post to this blog. 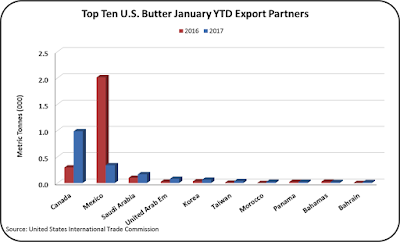 The decrease in exports of butter to Mexico was huge, causing Mexico to fall to a second place ranking in purchases by country. 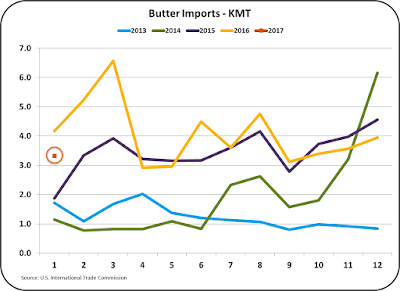 Imports of butter followed the same trends as cheese, with volumes midway between the prior two years. 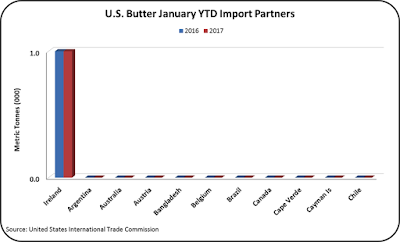 However, the surprising analytic is that all of the imported butter came from one country, Ireland. While Ireland was our largest import location for the full year of 2016, Mexico and New Zealand also supplied significant volumes. In January, imports from Mexico and New Zealand were nonexistent. 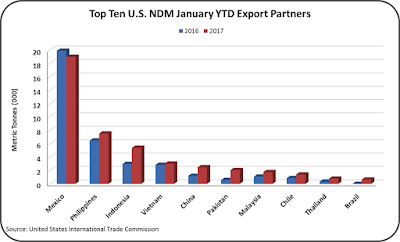 Nonfat dry milk exports were record setting for the month of January. While the volume is clearly good news, the even better news is that the price for January 2017 was well above the price for January 2016. The bad news is that the prices are still only half of the 2014 level pricing for nonfat dry milk. Therefore the Class IV milk price remains low. The exports of nonfat dry milk followed historical export patterns with the majority going to Mexico. 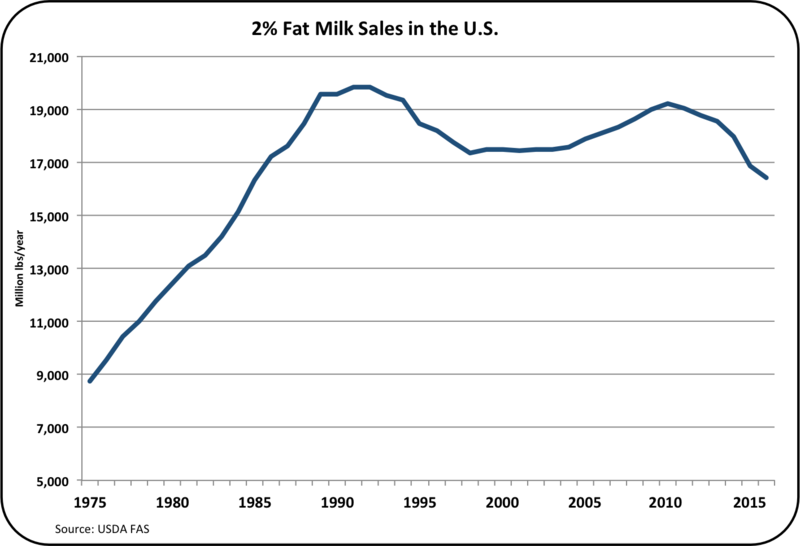 However, imports of nonfat dry milk again set record levels totally offsetting the increase in exports. Imports exceeded the prior year for all five of the top sources for nonfat dry milk. The biggest increase came for Chile where import volumes doubled from the prior year. 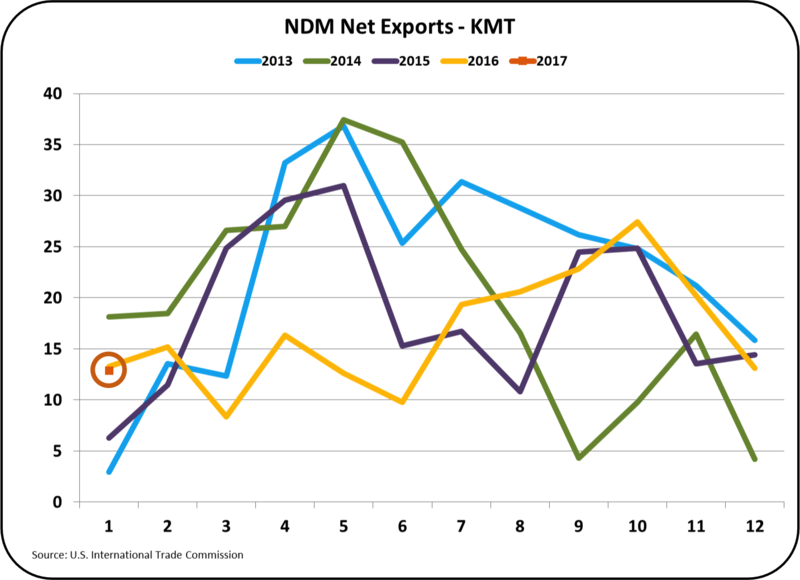 This has left net exports exactly where they were one year ago. There was no significant increase or decrease. 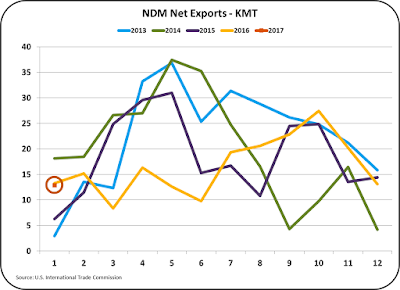 For the first ten months of 2016, there was a trend of increased net exports, but the last three months have reversed that trend. The second largest influencer of the Class III price is the price of dry whey (see prior post). Dry whey is largely an export item and the price reflects this. Volumes exported in January are slightly above the last two years, but still well below 2013/14 levels. Prices have escalated in recent months and are expected to maintain their current pricing. 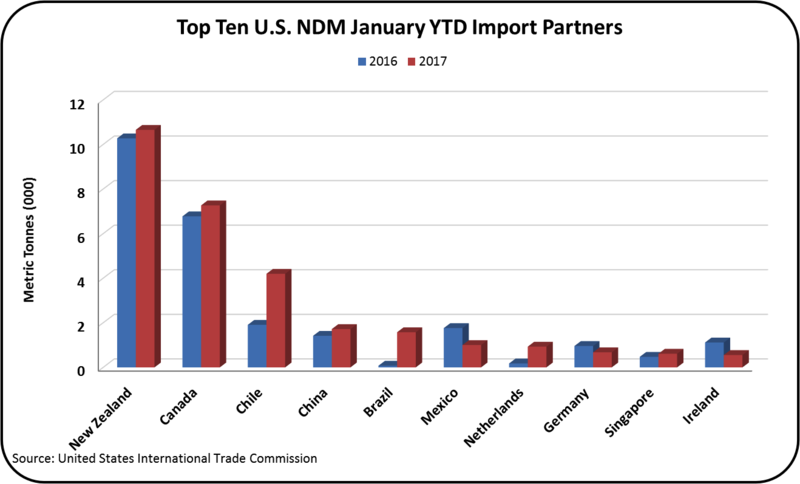 There are many things that could influence dairy exports and imports in 2017 including NAFTA, exchange rates, and the international milk supply. Volatility can be expected. Changes will be regularly followed in the blog. On March 1, February Class and Component prices were announced. The change in the value of dry whey and Other Solids was dramatic. Other Solids increased in value by 19.5% and dry whey increased in value by 10.7%. The majority of this post will cover these significant changes in the value of Other Solids and their impact on Class III pricing. The big change, which can now be recognized as a trend, is the increasing price of dry whey. Dry whey prices are the basis for pricing Other Solids. 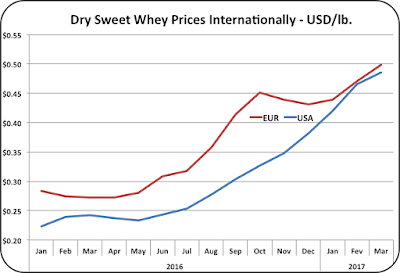 Dry whey prices started 2016 at $.24/lb. As of February 2017, the price has more than doubled to $.49/lb. As a result, the price of Other Solids has increased from $.04/lb. at the beginning of 2016 to its current price of $.30/lb. 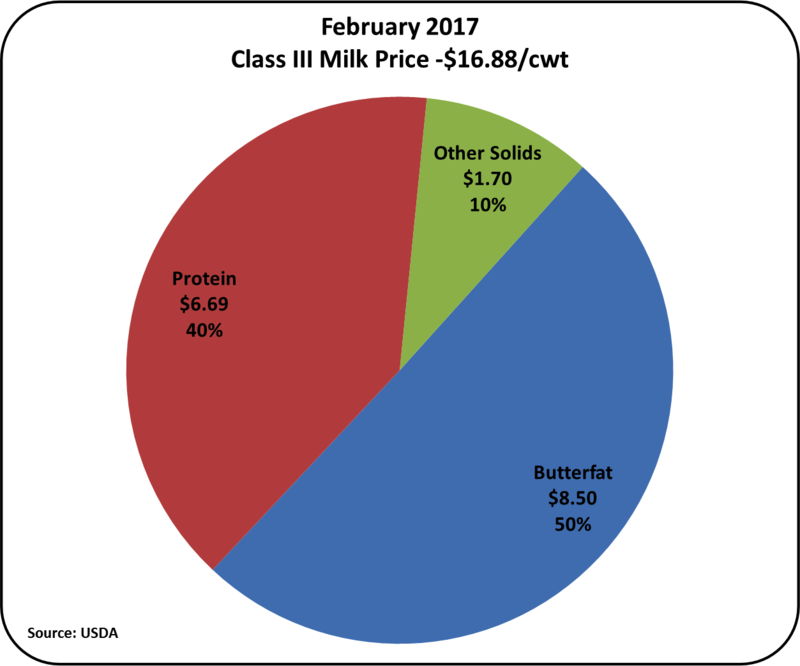 From January to February, the changing value of Other Solids increased the Class III price by $.27/cwt. Compared to a year ago, the change in Other Solids has increased the Class III price by $1.49/cwt. This change is far from insignificant. What makes dry whey a valuable product? Whey is what is left over when cheese is made. Cheese is composed of milk protein and butterfat. What's not in the cheese is whey. Whey is primarily lactose with a little less than 10% protein. The proteins in whey are the non-casein proteins collectively referred to as whey proteins. While whey is typically marketed as a protein source, the major ingredient, lactose, provides a sweet taste, which gives it the name "sweet whey." It provides a nice addition to health foods, bakery products, and other food products. In 2016, 44% of dry whey was exported so the domestic price is heavily influenced by international dry whey prices. Will the current prices hold up? 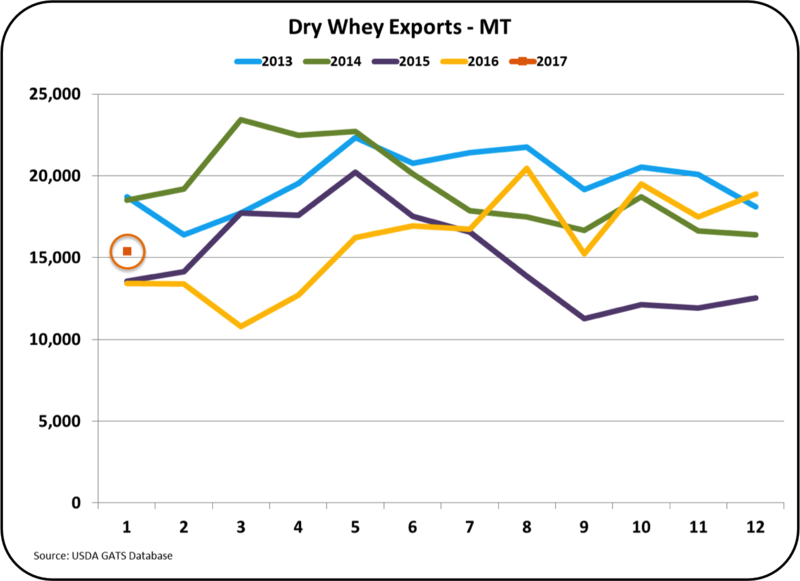 Dry whey prices in the futures market indicate a steady price in the upcoming months with a somewhat lower price around $.40/lb. by the end of the year. Another important analytic is how the U.S. pricing is compared to international prices. 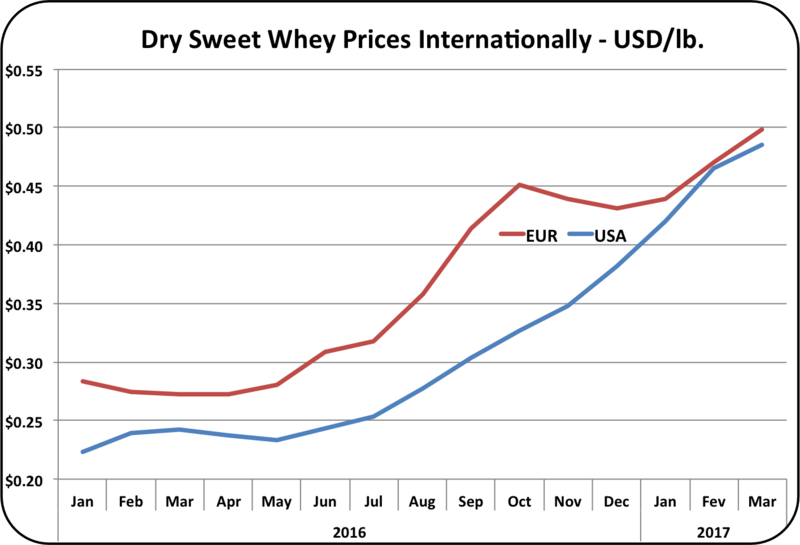 As shown in the chart below, U.S. dry whey prices are competitive with Europe and both have increased dramatically during 2016 and 2017. The final number in the chart below includes a March forecast number which anticipates a further increase in the international prices. Based on these analytics, it would appear that domestic dry whey prices will hold close to the current prices. 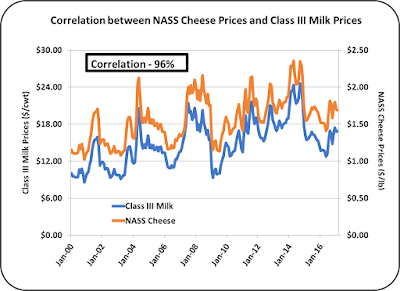 In March of 2016, I published an article in Progressive Dairyman analyzing the differences in California milk pricing as compared to FMMO pricing. 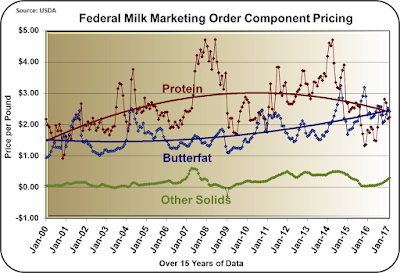 In the February 12, 2017 post to this blog, the proposed change in California from state controlled milk pricing to a Federal Order was reviewed. How Other Solids are priced is one of the reasons California is considering a change to become a Federal Order. California's pricing system also has a "lid" on the value of Dry Whey used for producer pricing. The change to an FMMO would eliminate this "lid." Other Solids are now worth $.30/lb. compared to $2.23/lb. for milk protein. The current payment system in California recognizes only "Solids Not Fat" which is currently valued at $.82/lb. Therefore, milk protein is currently worth only $.82/lb. in California. 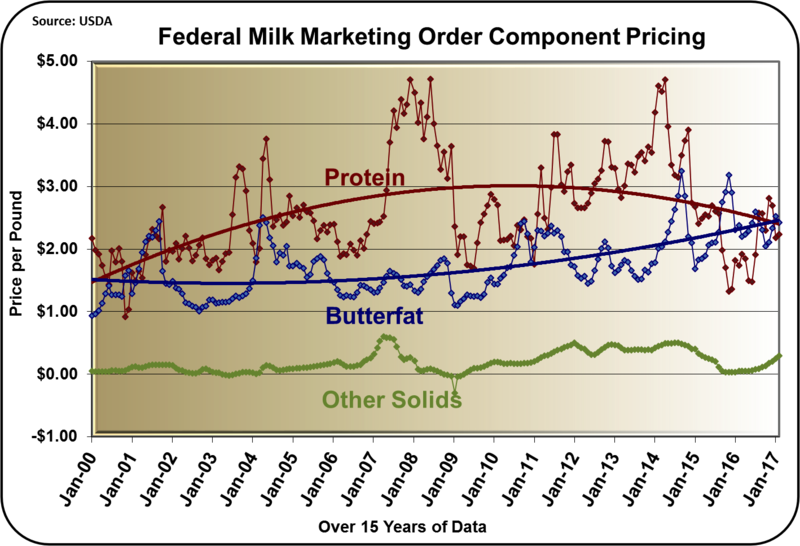 If producers vote to change California to a Federal Order, protein will be worth $2.23/lb. and Other Solids would be worth $.30/lb. If California producers vote to become a FMMO, it will certainly change producer strategies and practices in California. Considering that 20% of the nation's milk is produced in California, this change could impact the entire U.S. dairy industry. How this may impact overall pricing in the U.S. is uncertain. The USDA's proposal is under review and will be analyzed more in an upcoming blog post. The other changes in prices were small compared to the movement in dry whey and Other Solids. 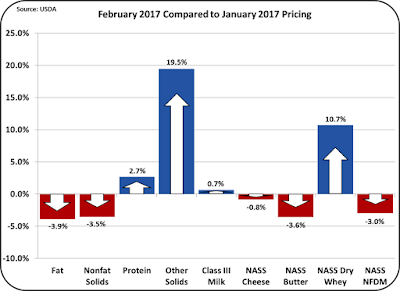 Milk protein increased slightly in February only because butter prices fell. See a prior post to this blog for a review of this relationship. 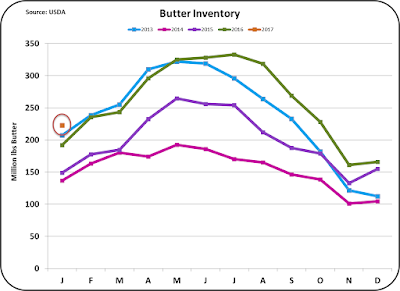 Inventories of cheese and butter were both up increasing concerns of oversupply. 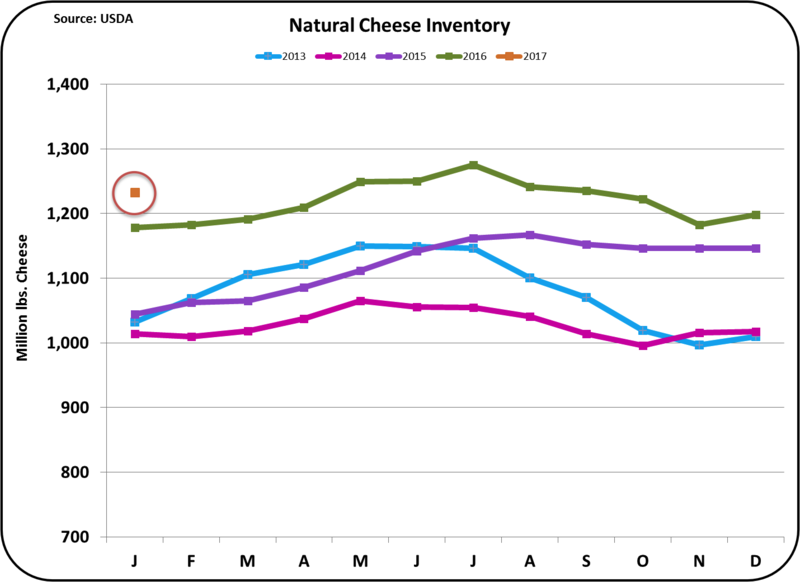 The potential oversupply has weighed on prices of cheese and butter which both declined in February. Nonfat dry milk is the basis for pricing Class IV milk. 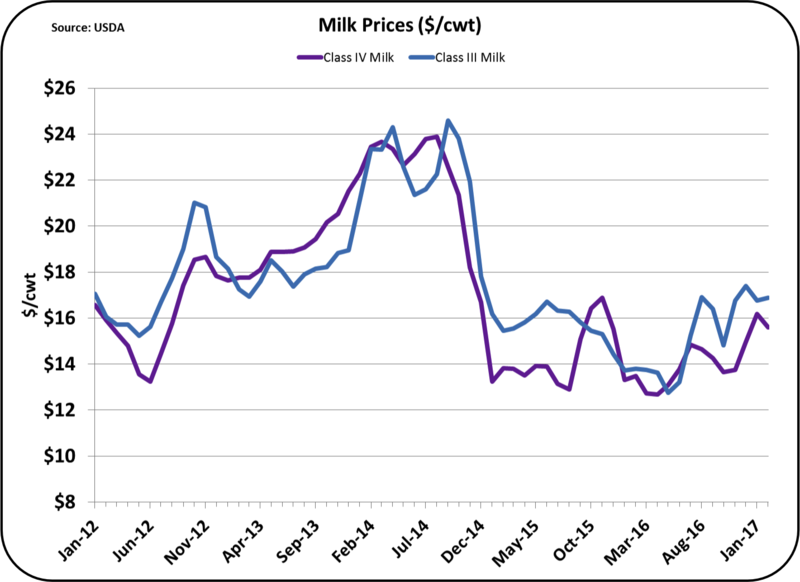 Class IV milk is always used to price Class II milk, and when it is higher than Class III, Class IV prices are used to price the Class I price. 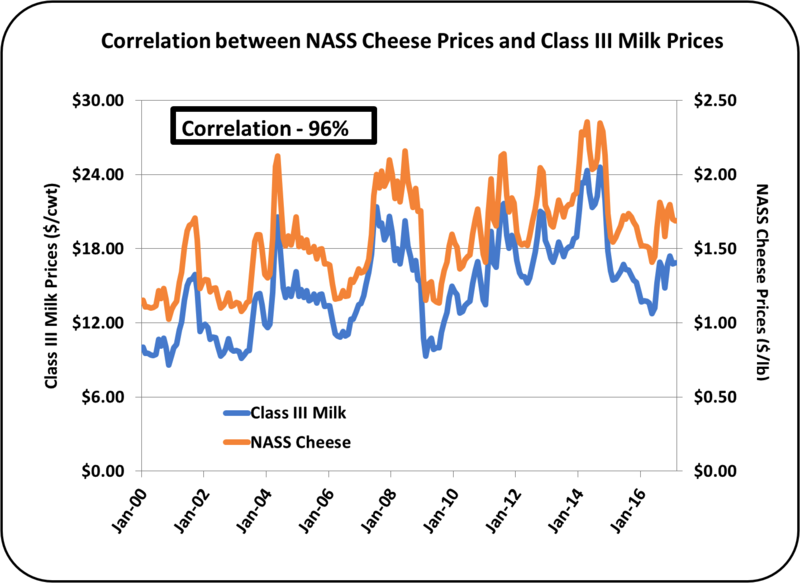 Class I milk is significant in size and can significantly influence both the uniform milk price and the producer price differential. 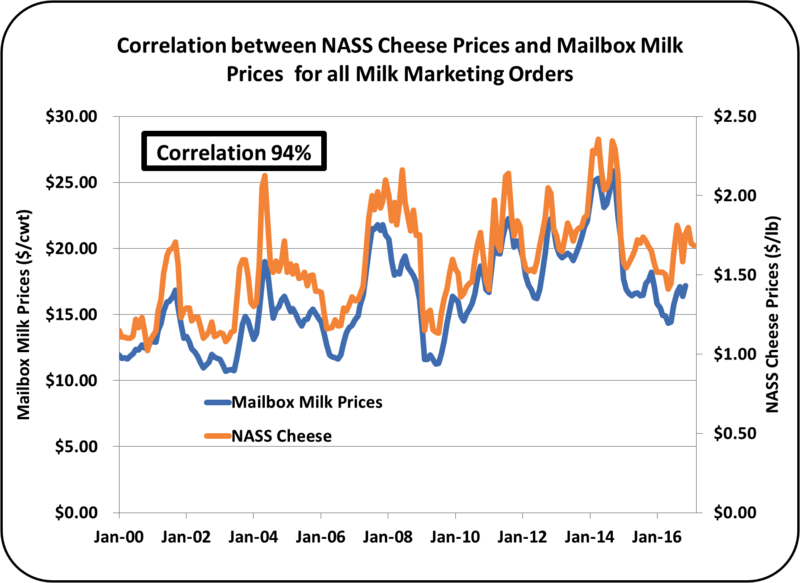 Because nonfat dry milk is priced based on international markets, the price has improved somewhat, but is still not near 2013/14 levels. 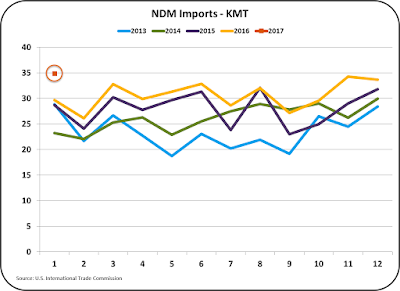 Therefore, no potential boost in the uniform milk price or the producer price differential caused by a spike in NDM and Class IV milk looks likely in the near future. The next post to this blog will cover export/import data as it becomes available. As covered in the prior two posts (part one and part two), imports are becoming more worrisome than exports.